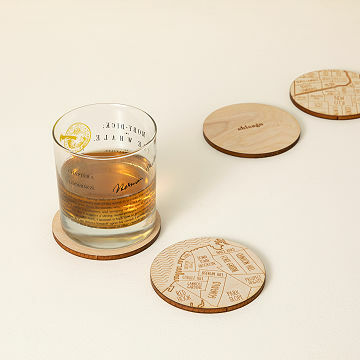 Celebrate your favorite locale with these cedar coasters that are etched with snippets of your urban grid. From the spot you met your sweetie to the locale of your favorite watering hole, this unique set of coasters celebrates the neighborhoods that make your city yours. Using her passion for typography and antique maps, graphic designer Aymie Spitzer maps out four sections of a city onto each coaster. She finishes one coaster with the city's name and established date, creating a rustic metropolis in cedar. This charming set is a toast-worthy way to celebrate hometowns, new stomping grounds or favorite corners of the country. Designed in Brooklyn. Made in Florida. Click here to see all available neighborhoods and check out our European Map Coasters. Graphic Designer Aymie Spitzer has a type. Or, rather, a thing for type. Her passion for lettering found in antique publications such as maps and foundry specimens inspires her work, which captures some of that aesthetic while telling the story of each city. She lives in San Francisco. Each set contains four coasters. I got these to give to our daughter and son-in-law for their first condo. Perfect Christmas gift for these native Chicagoans who purchased their condo inside the Chicago city limits. Lovely small works of art that can be left out for all to see. When in use, the coaster sometimes sticks to the bottom of the glass and suddenly drops off. Such a unique gift for those people who are hard to buy for and already have everything! They're really unique and well made but I wish their were a couple more coasters so that more neighborhoods could be featured. I would definately buy this product again. I was nervous about buying these coasters because a coaster is a coaster but when I received them I was wowed. I am proud to be giving them to my friend. The detail that went into them is extraordinary. These were great to replace our old, stained coasters. And they add a bit of fun. They were a bit thinner than I was expecting, so the engraving isn't very deep. I would buy another set of coasters again! The "neighborhood maps" is a great idea! Hope there will be more cities to choose from in the future.